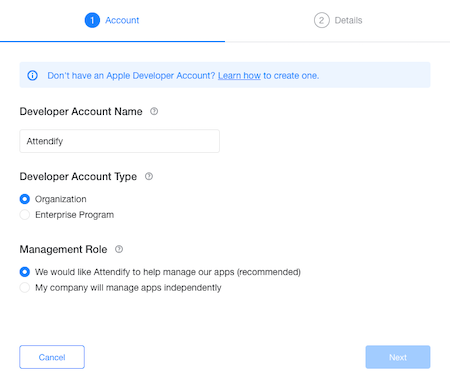 Learn how to add your Apple Developer Account details to your Attendify dashboard and then connect one to your apps when submitting them. Have you heard about the change in Apple's review guidelines in early 2018? As your organization is now required to have their own Apple Organization Developer Account to publish a branded app we want to make this process as easy as possible. If you haven't enrolled into the Apple Dev Program yet, here are the details on how to do this. 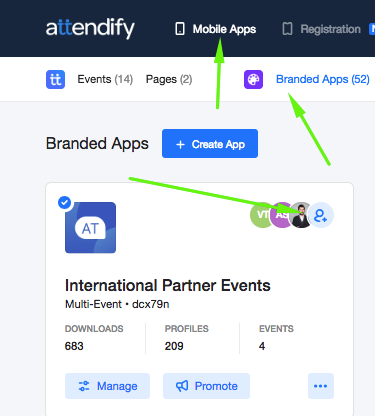 Now you can easily add all required details about your Apple Developer Account to your Attendify dashboard once, and then simply connect it to the branded apps that you'd like to submit. No need to send us an email with the details each time. To add a Developer Account go to your Attendify dashboard -> Settings -> Developer Accounts section and click on "Add Account" button. Now, fill in the pop-up form. Developer Account Name: The name you chose for your Apple Developer Account. To locate the name, log into your Apple's Developer account and select Overview. The name of your account is in the center of the page, above Apple Developer Program. Developer Account Type: Select here the type of developer account you have. Organization account is for the public App Store, Enterprise Program is for Private Distribution. Management Role: Select here the desired option. If you'd like us to manage your apps for you, you'll need to invite us as Admins to your dev account. We agree to not access any app other than an Attendify-powered app in the developer account. You can refer to our Terms of Service (9.d.) for more details. In case you cannot share with us access to your developer account for some reasons, you'll have to manage your apps independently. This applies to submitting the app's code updates as well. Scroll to the bottom of the article for instructions on how to export the required certificates. Note: We won't be able to build an app for you if you enrolled into the Apple Developer Program as an Individual. Depending on the Management Role you've chosen, you'll need to provide the following details. Developer Account Team Name: The name you chose for your Apple Developer Account. To locate the name, log into your Apple's Developer account and select Overview. The name of your account is in the center of the page, above Apple Developer Program. Company Name: Is a unique name that is displayed underneath the app name in the App Store. Please note the companies name cannot be changed in the future. Technical Contact Person: A person we should get in touch with in case there are any tech questions concerning your Apple Developer Account. 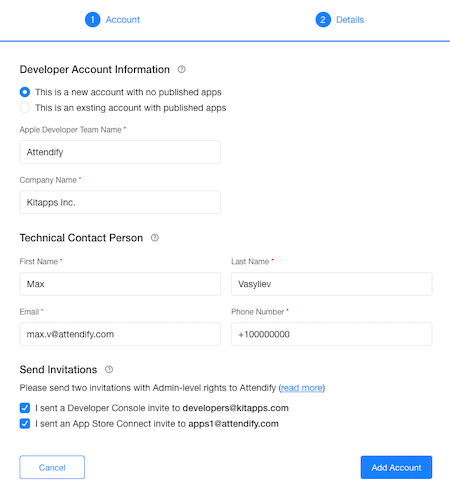 Send Invitations: Confirmation that you have invited Attendify to your App Store Connect account (with admin-level rights, sent to apps1@attendify.com). Here you can find the step-by-step instructions on how to send the invitation. And if you decided to manage the app independently, we need you to provide us with the following certificates to build your app. Once you filled in all the fields and sent the invitations/uploaded the certs, just click on the Add Account button to save it. It will be added with Pending status and switched to verified once our team reviews the details. 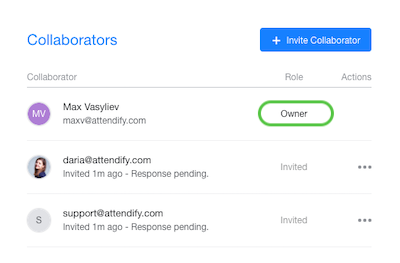 Regardless of the status of our access you can now connect accounts you've added to your branded apps on the Settings step of the building process. On the pop up screen the owner will be the first person labeled and be the individual labeled as owner.